CommerceM4 is one of the top commerce website themes for the Mobirise website builder. 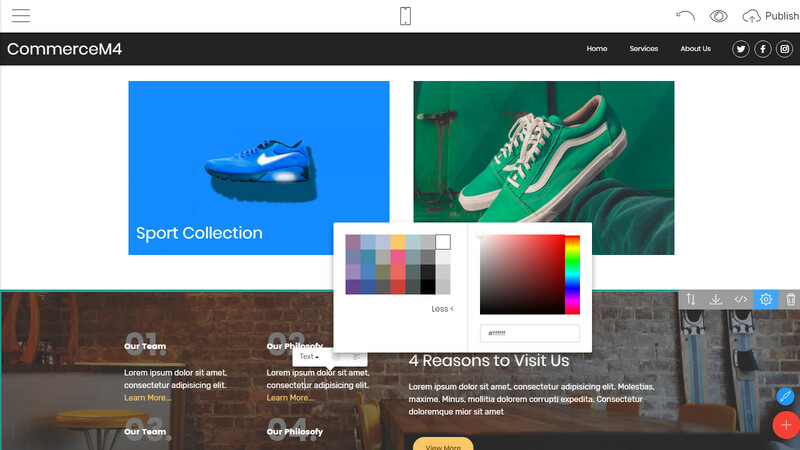 Mobirise is a free website builder that features drag and drop functionality. One of the best benefits of the designer is that it is available offline. CommerceM4 is a theme that helps you to create a wonderful website to sell your products. With it comes all of the features that you would expect a successful website to have. All of this comes at the low price of $39.00. 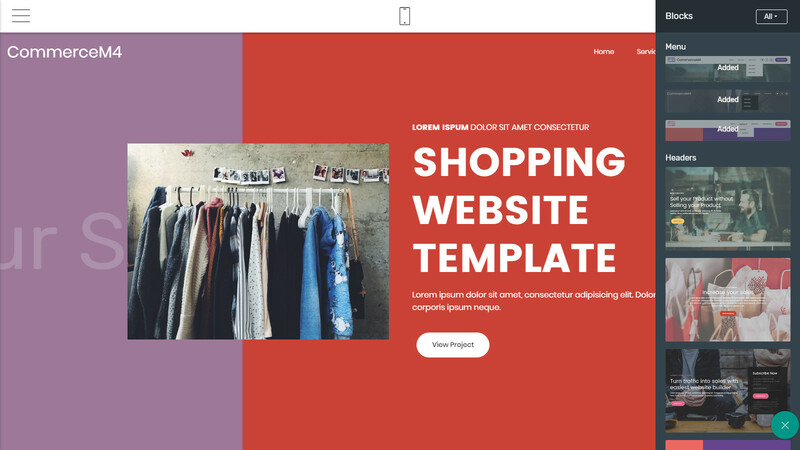 No one wants to have to pay for a Bootstrap shopping cart template but in the age of powerful, stylish websites, it can be the best investment that you ever make. Here is what makes the shopping website template so powerful. Bootstrap 4 is a tool designed by Twitter to help make websites more streamlined when it comes to coding. Pieces of code are pre-designed to help ensure speed and search engine optimization. It also ensures that all standards are being met for current coding best practice. CommerceM4 has Bootstrap 4 completely incorporated into the theme’s design. You know you are getting the best code this way. It also is logical for use with the Mobirise shopping website builder. 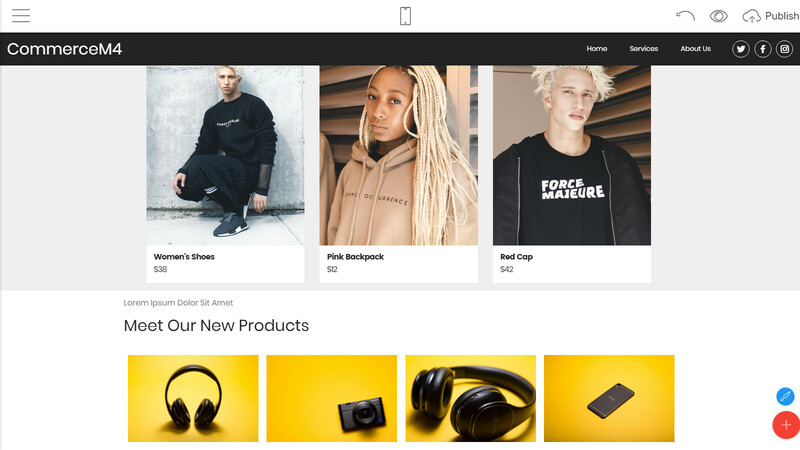 Mobirise allows you to take the CommerceM4 shopping site template and build with blocks that are perfectly optimized for the Bootstrap 4 coding. This also makes the design of your website easy to achieve. 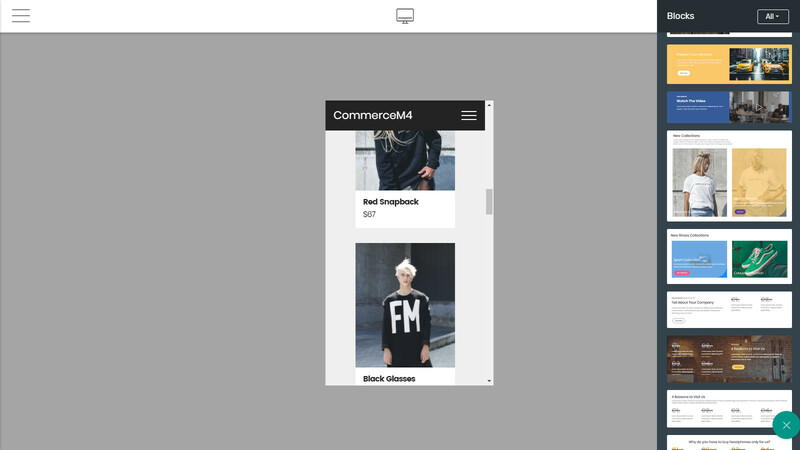 After you have selected the CommerceM4 shopping website theme you can load the basic layout in the Mobirise editor from there. Once you have added the blocks that you want to the page you can drag and drop them to the location that you want them to appear on your website. The system allows you to drag and drop as much as you want so that you can experience a truly customized design. Now that you have the layout that you desire for your website, it comes time to add the content. You will find that the content that comes on the blocks is generic, it isn’t designed to be used. You can fill in your own text, change colors, add pictures, and brand the website to match your company’s image. The majority of modern internet users Access the internet through their phone. Mobile friendliness is absolutely necessary with a shopping website theme and CommerceM4 takes that into mine. All websites are designed with CommerceM4 are mobile ready and able to be viewed on any device. Not only does mobile friendliness help you to have a website that will work on every browser it also helps with your search engine optimization. On devices such as cell phones and tablets Google optimizes search results for what will display best on the device. That means mobile friendly. Cheaper to use than most free Bootstrap themes at only $39.00 and you don’t need to hire a professional designer so you save money there. The easy of use designed into both Mobirise and CommerceM4 make it a pleasure to use. A lot of work has gone into CommerceM4 to make it a high quality theme with the best programming. CommerceM4 boasts a wide selection of options to help get the website features you want. Speed is necessary to match expensive websites and CommerceM4 helps to provide that. Updated and modern features to meet the standards of web design and search engine optimization that the commerce world demands. CommerceM4 does cost money, but you get a big bang for the small buck. You still need to find hosting, especially if you want quality hosting. Non-CommerceM4 extensions might cost more money. If you are looking for a quality design solution for your commerce-based website, then CommerceM4 is the shopping website template you need. The power you get from the features and the ability to give your site a unique design, give the advantage over other design platforms. You can’t beat the price either.